On a weekend with almost 100-degree temperatures, ash and smoke in the air from fires in the Sierras, and alerts from the Air Quality District on high ozone levels, the Best.Ride.EVer! campaign had a very successful day in Fresno. The event was co-hosted by Center for Sustainable Energy (CSE) and Project Clean Air, in coordination with National Drive Electric Week Fresno, and Team Captain Tom Cotter. The event included static displays from solar companies, a credit union, CVRP booth, Clean Air Project, NRG, an electric school bus, and 24 personal EV owners and their vehicles. The ride and drive was a highlight of the event and featured 12 vehicles from six local dealers. A taco truck was also on hand providing two FREE tacos to test-drivers and participants., courtesy of PG&E. A local Spanish radio station, 92.1, was on hand announcing the event ‘live’, and giving out free popsicles. Bring your family and friends for this one-day only opportunity to test-drive a number of different electric vehicle (EV) models in one place. Learn how to reduce your driving costs while curbing pollution. Join us in the Central Valley for an afternoon of electric vehicle fun! There will be free tacos for the first 200 test drivers from Fresno’s reigning Taco Truck Throwdown winner El Premio Mayor, a live radio broadcast, and of course a number of EVs for you to test drive and check out. Already own an EV? Join us and display it in the largest gathering of EVs in Fresno. Please register (not required to attend) and volunteer at the top of this page. Volunteers needed at all levels! Share with family and friends on Facebook. When people take a ride in an EV, they are much more likely to appreciate that these vehicles are real, high performing, plausible, fun, and exciting vehicles to drive. See for yourself and try the Best.Ride.EVer! 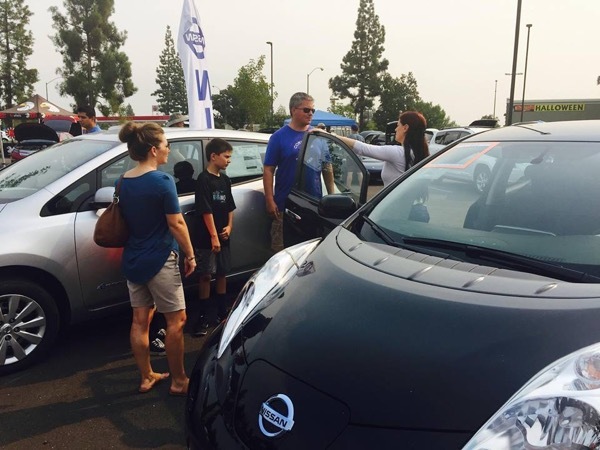 Our last event made the news on KSEE 24 with the "Largest Gathering of Electric Cars" in the Central Valley. Once again, real EV owners will show off the cars we love and provide information to the public. We will present an award to a local company, public official, agency, or community organization that has done a lot to promote EV-readiness in the Central Valley. The Central Valley’s event is one of more than 160 across the country where electric vehicle owners and their neighbors will hold electric car parades, “tailpipe-free” tailgate parties, recognition of leaders promoting EVs, launches of new public EV charging stations, and other public events. The event is part of the fifth annual National Drive Electric Week (formerly National Plug In Day). National Drive Electric Week 2015 is presented by Plug In America, the Sierra Club, and the Electric Auto Association. Nissan LEAF is the exclusive automotive sponsor. Also sponsored by ClipperCreek and PlugShare. Fresno event organizers: Central Valley Electric Vehicles, Center for Sustainable Energy, California Plug-In Electric Vehicle Collaborative (PEVC) and San Joaquin Valley Clean Cities Coalition (Project Clean Air). Registered attendees report 464,329 electric miles driven.